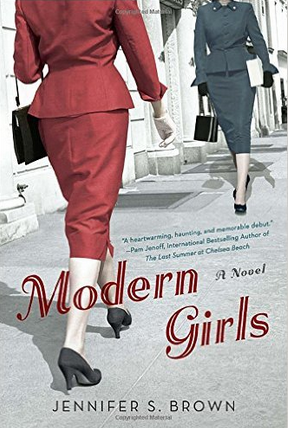 Modern Girls by Jennifer S. Brown is such an engrossing novel. Once I started, I couldn’t stop reading. Brown has an incredible hand with details, using every one of the five senses. I feel like I know the textures and smells of the streets and cramped apartments of the Lower East Side in the 30’s, the closeness of living in small spaces with large families. I could taste the pickled tongue and smell the scent of Aqua Velva. Brown also has a skillful hand at weaving in historical details. I learned so much about this time in our history, both culturally and politically, and am intrigued to know more. Modern Girls is told from the points of view of both Rose and her daughter Dottie. As a writer, I am impressed with the way Brown effortlessly moves from one distinct voice to the other. I love both main characters with equal measure. A wonderful debut! Louise Miller is a writer and pastry chef who lives and works in Boston, Massachusetts. She attended Portland School of Art (now Maine College of Art) where she studied photography. She left art school when she ran out of money, and still dreams of going back someday. Louise started her first baking job in 1994, at a little bakery in Cambridge, MA. She hated her first job, gave notice and had vowed never to work in a kitchen again, when on her last day she met her baking mentor, who talked her into staying on by offering to teach her the art of pastry. Louise has been a baker/pastry chef for over twenty years. She has worked in an exclusive golf club, the private kitchen of a major investment firm, a macrobiotic restaurant where she could only use maple syrup and barley malt as sweeteners, and a kosher gourmet shop. She is currently the pastry chef of The Union Club of Boston, a historic private club formed in 1863, where she has worked for the past thirteen years. A lifelong lover of reading, Louise began her first attempt at novel writing in 2009. She received a scholarship in 2012 to attend GrubStreet’s Novel Incubator program, a year-long workshop for novelists, where she worked on the final revisions of her novel The City Baker’s Guide To Country Living.